Mumbai: State-run banks have stopped giving fresh loans to loss-making state-owned power utilities because the government is concerned that such lending could potentially lead to a rise in bad loans. “They (finance ministry) have advised banks against increasing exposure, particularly to state electricity boards," an executive with a state-run bank said on condition that neither he nor his bank be named. “Even the existing sanctions are put on hold." The development assumes significance in the face of rising bad loans in banking. Indian banks have seen their non-performing assets (NPAs) growing the fastest in the past five years in the April-June quarter, when gross bad assets rose by 7.64%—from ₹ 60,685 crore to ₹ 65,318 crore. Most of the NPAs are due to frequent loan restructuring in the real estate, aviation and textile sectors. “Banks have already stopped loans to state utilities," said Rabindra Nayak, senior analyst at SBI Cap securities Ltd. “Unless there are reforms, given the kind of rise in fuel prices, they (power firms) will be in real trouble." To be sure, there’s no blanket ban on power sector loans. “We are not taking fresh exposure to distribution companies, which are in losses, though there is no total ban. Wherever they make profits, we lend, whether they are generation or distribution companies," said R. Ramachandran, chairman and managing director of Andhra Bank. “If there is a government directive, we will follow that." Bank lending to the power sector has grown rapidly in the past one year. According to Reserve Bank of India data, bank loans outstanding to the power sector stood at ₹ 2.9 trillion on 26 August, compared with ₹ 2.19 trillion a year ago. However, the growth in the April-August period stood at 10.8%, slower than 16.9% in the same period last year. Typically, banks lend to power firms at up to 2% above their minimum lending rate for maturities ranging from one to seven years. Nearly half of the total infrastructure lending of banks is in power projects. Rating agency Crisil Ltd has recently issued a warning, saying around ₹ 56,000 crore lent to the sector is at risk “if there is no meaningful progress on reforms in the next 18 months". The risks are due to escalating losses and debts in the electricity distribution sector and a shortage of fuel. “Due to funding of these losses by debt, the cumulative debt of state power utilities has risen to an estimated ₹ 3 trillion at the end of March, 2011," Crisil said. 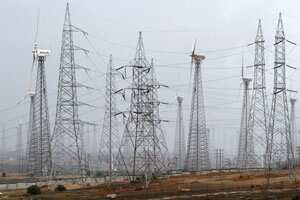 Nine states, including Tamil Nadu, Rajasthan and Punjab, account for the bulk of the power distribution sector problems and are the most vulnerable to credit risk, the agency said, because they account for about 85% of the sector-wide losses. Crisil estimates that the aggregate debt of power distribution firms of these states stood at ₹ 1.4 trillion on 31 March 2010. A major problem faced by power distribution utilities is the absence of tariff revision, a power ministry official said on condition of anonymity. For instance, the state electricity board of Tamil Nadu has not revised tariffs in past seven years, while Rajasthan’s distribution utility has not done so in past four years. The distribution utilities of Uttar Pradesh and Bihar have not even finalized their accounts in years, the official said. Ajoy Mehta, managing director of Maharashtra government-owned power distribution firm Mahavitaran Ltd, said the utility has not been using bank loans to finance deficit. “We do take short-term loans but not for financing our deficit; we are one of the best distribution utilities in country with aggregate commercial and technical losses of only 17%," Mehta said, adding the state utility files aggregate revenue requirement with the state power regulator for tariff revision regularly. The government has appointed a committee under former comptroller and auditor general V.K. Shunglu to suggest reforms in power distribution sector. The draft report of the committee has pegged losses of distribution utilities at around ₹ 1 trillion.